First time that I'm going a monthy goals post! Yay me ;-) I figured some accountability was in order! Keeping it simple as it's the first time! Happy October, friends!! You are ambitious!! Good luck getting this done in October! Muscle memory IS totally for real. I am battling it for sure. If you fin anything good let me know. 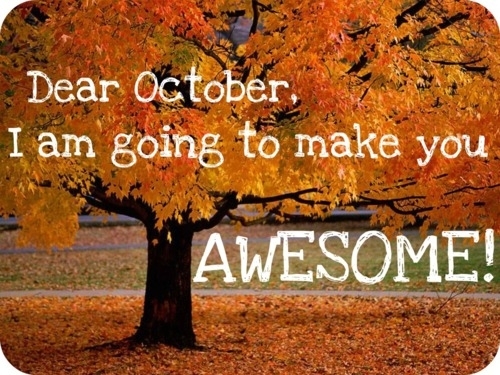 I think you have set yourself up for a pretty amazing October. I see a running theme with everyone being a fan of October even me who doesn't get to enjoy the Fall weather! I think you have some great goals lined up for your fitness and family things. What date is Thanksgiving in Canada again? Accountability really does give incentive to get things done! Love and can relate to all of your goals. Good luck! Awesome list! Love that you're signing up C for skiing - how fun! I love your goals, and how you've organized them into categories. Oh how I have got to get in a better rhythm for workouts!! I do good one week and then the next fall off the wagon!